Norman Vasu, Benjamin Ang and Shashi Jayakumar (Eds. 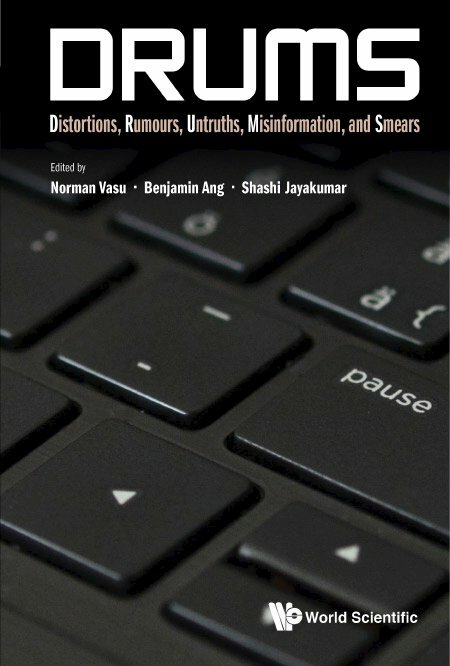 ), DRUMS: Distortions, Rumours, Untruths, Misinformation, and Smears, Singapore: World Scientific Press, 2019, 10 January 2019.
by Norman Vasu, Benjamin Ang and Shashi Jayakumar (Eds.). Fake news is not new, and this issue poses an even greater challenge now. The speed of information has increased drastically with messages now spreading internationally within seconds online. With countless photographs, opinions, and hours of video published online every falsehoods proliferate rapidly. Readers are overwhelmed by the flood of information, but older markers of veracity (respected publications, official sources) have not kept up, nor has there been a commensurate growth in the ability to counter false or fake news. In many cases, staid publications of record such as newspapers have been eclipsed by new, visually attractive, and sometimes false, sources of information. All this has given an opportunity to those seeking to destabilize a state or to push their perspectives to the fore. Modern disinformation operations only need free Twitter or Facebook accounts or access to platforms such as WhatsApp or Telegram. DRUMS: Distortions, Rumours, Untruths, Misinformation and Smears deals with the appeal of DRUMS, the ways DRUMS is employed, and measures to counter it. Organized in three sections — (i) Cognitive Predispositions and DRUMS, (ii) The Employment of DRUMS, and (iii) Countering DRUMS — this book offers a holistic discussion through the different specializations and different experiences of its academic, think-tanker, or policy practitioner contributors. DRUMS: Distortions, Rumours, Untruths, Misinformation and Smears aims to serve those new the topic or subject matter specialists seeking to widen their knowledge on other elements of the issue.